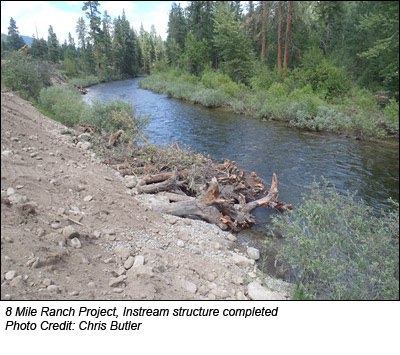 The Chewuch River 8 Mile Ranch Project is a partnership between the Yakama Nation Upper Columbia Habitat Restoration Project (UCHRP) and the U.S. Forest Service, Methow Ranger District to restore instream habitat on the Chewuch River. and stream complexity, provide bank stabilization, and create a more naturally functioning riparian area throughout the restored area. 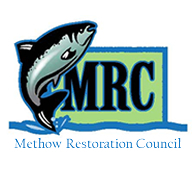 The intent of the UCHRP is to implement science-based habitat restoration to benefit fish species that are listed under the Endangered Species Act (ESA) and to forward Yakama Nation Fisheries’ mission to restore culturally important fish populations and their habitat throughout the Zone of Influence of the Yakama Nation. 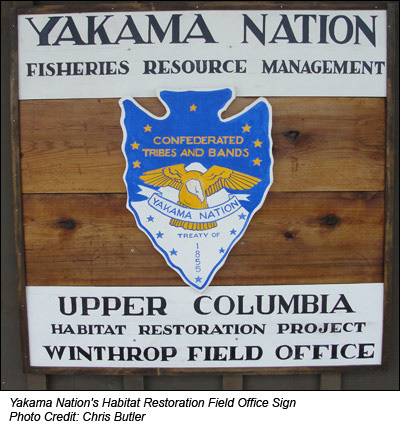 Currently, the Yakama Nation UCHRP is working with private landowners, as well as state and federal land managers, to implement restoration projects that are identified in each reach assessment for the Wenatchee, Entiat, and Methow river basins. Projects include such elements as side-channel reconnections, floodplain development, additions of large wood structures, habitat enhancement and creation, and road, bridge and culvert improvements. reconnection, fence removal, and re-vegetation of 6.87 acres with native plants to create a stable and more natural looking and functioning riparian environment. Collectively, all of these portions of the project will improve habitat complexity in a productive spawning reach and better support the diversity of salmon and steelhead life stages. watershed because of the cold river temperatures found year-round at this location. Returning adults prefer to hold in this colder water and spawning takes place both upstream and downstream of the ranch area. These projects are designed to improve survival rates of young fish, thus improving adult returning rates over time. All instream projects will improve survival rates for both resident and anadromous fish species while landward improvements will provide habitat for birds, mammals and reptiles. Instream structures will provide hydraulic refuge and improve chances of fish survival for young emerging and rearing fish while providing shade and cover for returning adults. Moving the fence away from the stream will help maintain the vegetative buffer along the river, resulting in a cooler, shaded river corridor over time.